I'm loathe to start another blog post with 'the weather', but ISN'T IT GORGEOUS! I've been quacking about this summer being a re-run of 1976 since February (should have taken my hunch to William Hill, dammit) so I'm making the most of every sun-kissed moment. When the sun's out, it's as if the years fall away and I just want to get outside and play (and chase ice cream vans, natch). 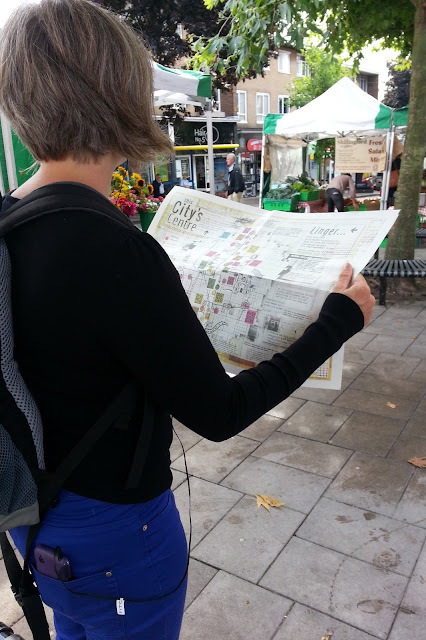 So this week I grabbed a couple of friends, some copies of the new interactive Exeter map, Linger – hot off the press! – and hit the streets in search of fun. Part 2 of the This City's Centre project (Part 1: Window is a video+sound installation at RAMM, which I wrote about earlier), Linger is a beautifully designed manifesto for playful interaction. An artwork in itself, the map encourages you to explore the city centre with an open mind and a willingness to participate, to engage in positive activity and to immerse yourself in the familiar in a way that reveals fresh perspectives. 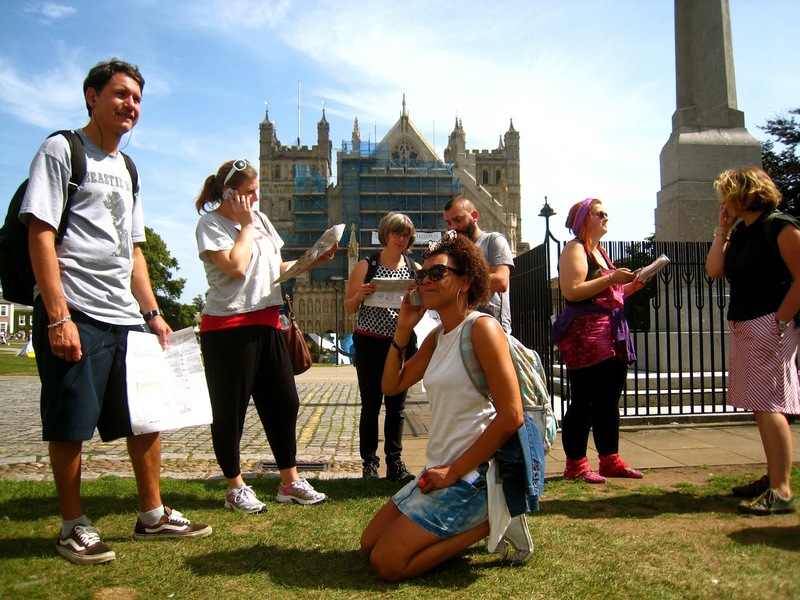 The colour-coded actions under different headings – including Street Dance, Be Neighbourly, and With No Particular Purpose – direct you on a walk around the city, inciting experiences and interactions along the way. Some of the locations have QR codes attached. Scan them with your smartphone and you are pulled inside someone's life as their experience of that location unfolds in your ears. Standing by the war memorial in Cathedral Green, you hear revelations about the night-time behaviours witnessed by one resident; sitting on a tree-dappled bench on Fore Street, looking down towards Exe Bridges, you hear hopes and dreams for alternative vistas and are asked to imagine what you would do to change the view. I'd like less traffic, personally. On the steps in front of the Cathedral we performed Green 2 and danced the Twankidillo. Behind Rougemont Gardens we followed the directions for Purple 7 and found a secret spot with spectacular views. On the crossroads of South St and North St we embraced Blue 3 and became monuments that announced our hopes for the city. But mostly we had a huge amount of fun. We tweeted our pictures and thoughts to @thiscityscentre using specific hashtags – you can see the interactions on the website. It's such a common city-centre sight: people glued to their phones, plugged up with earphones, transported from their present location by the escape afforded by technology. Linger uses the same technology to root you firmly in the here and now. By hearing the voices of your neighbours, of people who have walked the same stretch of pavement over and again, just like you, and having their ideas, opinions and thoughts flow into your ears as you contemplate the exact same view that inspired those thoughts, you just might – as I did – feel increasingly connected to the people around you. It creates an opportunity to meet the city anew, to appreciate its intricacies, to see beyond the perceived mundanity of transitional actions – waiting for a bus, rushing to work – and hear the beating heart of its inhabitants. Maps are designed to take you from A to B; that is their purpose. In its playful yet insightful subversion of that premise, Linger encourages you to enjoy the journey. Pick up a copy of Linger for £2 (at that price you can have one to play with and one to frame – it's that lovely) from RAMM, Exeter Phoenix and various other outlets across the city.